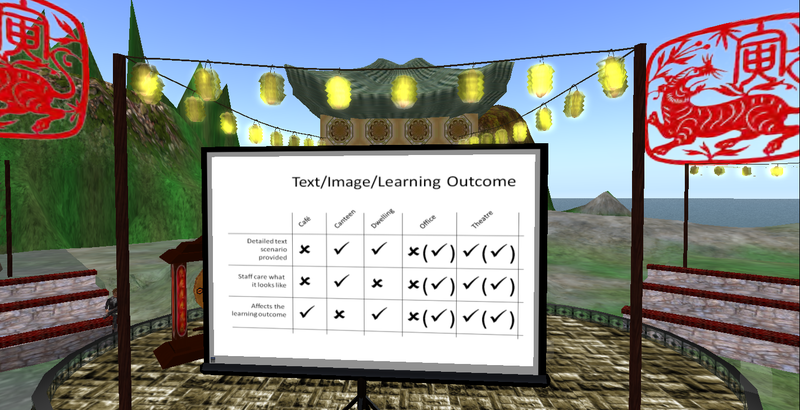 On the 2nd day of the Virtual Worlds Best Practice in Education (vwbpe) I started out by participating in a session by Graham Mills entitled “TBinSL – Thinking Big about the Very Small”. Graham spoke of the use of SL for visualization of especially molecules, gene data and cells and what was particularly interesting was that he rezzed various objects to support his slides such as the TB genome illustrated below. Afterwards Graham blogged about his experience mentioning a couple of the challenges a presenter may face. First of all he forgot to lock the slide viewer, which meant that people in the audience could change the slides – for those who have not attended a presentation in-world it may seem rude or strange that the anyone in the audience would do this, but in my experience many SL users spend time running their cursors over objects to see if any are interactive – in spite of this, it was not a problem I was disturbed by during Graham’s presentation. As I understand it, vwbpe-presenters had been encouraged to use the so-called SpeakEasy-tool by the conference organizers. The SpeakEasy-tool enables the presenter to deliver pre-typed text into local chat, while presenting thus allowing the hearing impaired or anyone else to get the information in the form of text too. I have not tried out the SpeakEasy-tool, but judging from Graham’s post it adds yet another element to the many issues an in-world presenter needs to be aware of. Graham wisely chose to react instantly to the comments and questions in the local chat during his presentation. This local chat phenomenon is in my point of view one of the major strengths of SL because it has the potential of opening the dialogue between the presenter and the audience. Having run 4 course in-world I do however also know how complex the communication becomes, especially if you have no one to help moderate, and I can fully relate to Graham’s description of the situation. Note that on the University of Liverpool Island it is possible to check out some of the amazing visualizations Graham and his colleagues have been working on. Graham has also started to explore some of the new features in the SLV2 such as Shared Media and shadow effects, and on his blog, you’ll find some interesting posts on this. The next session I attended was a presentation by Kattan Hurnung, who spoke of her experiences with “Design to develop Virtual Wolds”. In this post you’ll find both Kattan’s slides and a recording of her presentation. Via 5 examples of designing respectively a café, a canteen, a dwelling, an office and an operating theatre Kattan presented a very interesting grid that depicted the relations between information provided if forms of text, images and/or scenarios and the expected learning outcome given by teachers prior to the start of the process of designing these different types of learning spaces. I thought there were many interesting points in Kattan’s presentation and one of the things I took special notice of was her questioning the level of details in designs. Building in-world surely can be very time consuming and perhaps it isn’t necessary to aim for photo-realistic builds – less may suffice as long as the design appears believable. Next up was a presentation by Kristy Handrick; “Revealing the didactic character of imagery in Second Life.” Unfortunately the technical problems I’d had the day before continued, everything rezzed incredibly slow and I had problems with adjusting the camera, so I gave up and took a break. Kristy also blogged about here experience as an in-world presenter and made an important point on how the SpeakEasy-tool can be helpful to ESL presenters, and since I’m also struggling with the English language, I think I may just try out the tool for my next presentations. The last session I want to write about in this post was a fascinating conversation between Dusan Writer and Tom Bukowski (author of the book “Coming of Age in Second Life: An Anthropologist explores the Virtually Human”). My computer still acted out, but the sound was good and I was really glad to participate in this since it raised a lot of questions/comments I need to look further into – here merely presented as points, but for those interested in seeing/hearing the conversation a recording can be found here. SL is a site of culture and cultures are constantly changing, though some things remain permanent. On AFK Tom discussed the difference between presence (to be present) and immersion (to be in a place) and how virtual worlds enables us to be immersed without being present. Tom was fascinated by the way “friendship has become the new default mode of social relations”, and questioned 1) how friending presumes a relation that is based on choice, and 2) the apparent egalitarian nature of such a relation. And how does this affect teaching – should we as educators friend our students, is it a cool egalitarian thing or is it just a way of masking the fact that we’ll be grading them? Tom studied SL in its own terms meaning he didn’t try to track down SL users in “actual” or “physical” world. This methodological approach naturally depends on one’s research question(s), but he draws the line with the common idea that no research project can be legit unless it also involves studying people in the actual world. It’s sort of a slap in the face of virtual worlds and it’s misunderstanding that what happens in virtual worlds is real, it is culture. There is more and more evidence of SL users identifying with their virtual personas/life – e.g. writing your avatar name on a receipt or wondering how many prims an actual building represents. We have just scratched the surface of ways in which virtual worlds are going to affect our actual lives. Technologies are neutral – the blow back could be positive or negative – that’s up to us, the users, the creators. There is a lag between the technology being invented and us realizing what we can do with it. “Techne within techne” – e.g. the ability for a group to collaboratively change the world that they’re in real time. The number one thing about a virtual world is that it is a place – techne makes the world; you can have techne inside the world, which is a new possibility. I personally don’t agree that technology is neutral and I was a bit confused when hearing Tom at the end speak of different levels of user-control in different types of virtual worlds (to me the level of user-control indicates foundational ideas forced upon the users by the system developers), but other than that I really found this conversation highly inspirational! Well, the jury is still out on that question. My main concern is whether I really need more information? It may seem a bit strange, but I’m already experiencing some information overload from existing mail lists, the blogsphere and my other networks. At this point in time in my PhD-project I really should be aiming at convergence, but on the other hand the constant drawback of living in a connected, digital world is the fear of missing out on important information. As always information management is key and I’ll return to that. Even though I’m a newbie, I have of course been listening in on colleagues’ discussions and research, comments in the media and especially in the blogsphere etc., but I have to admit that it wasn’t until yesterday’s experience that the use of Twitter became valuable to me, which leads to the next question. In yesterday’s event it was possible to use Twitter and Facebook as backchannels during the live-steamed presentations. Despite newbie problems trying to figure out exactly “how to” and also some language constraints (Twitter and general Anglo-American idioms and lingo), I did find the Twitter chat valuable. I’m familiar with the backchannel phenomenon from SL, where especially the Metanomics show makes really good use of the backchat (via the so-called chatbridge) to democratize and expand the discussions, and in my PhD I’m focusing on promoting this particular way of communicating in my in-world teaching sessions. Now, I’m not sure if yesterday’s speakers actually followed the Twitter chat real time (they seemed to focus on the local f2f audience), but after the presentations several of the speakers continued discussing and elaborating, and as I understood from experienced Tweeters this is common practice. George Siemens (one of yesterdays speakers) wrote an interesting piece on “frustrating (= non-participative, non-sustainable) conferences” and together with Tittenberger and Anderson, he wrote an article on how to improve live participation and sustainability of conferences – and yesterday was the first time I had a really good experience with this (outside SL) thanks to Twitter. There can of course also be disadvantages to this backchannel phenomenon as expressed and experienced by Danah Boyd in this much debated post, but I did see an interesting potential and I’m sure I’ll be logging in to Twitter for future events. However, I’m not so sure that I’ll start using Twitter on a daily basis – at least not for now. I definitely need to learn more about the many possibilities, so for a while I’ll settle for being a lurking participant in the periphery until I get a better feel for the many accompanying tools one can choose to use in relation to Twitter, and that leads to the final question. Evidently writing a max. of 140 characters is not complicated – it’s the management/storage of information that can be a little tricky, not least because there are so many different accompanying tools to choose from. When I started out yesterday, I already had FriendFeed installed and I like that probably because I’m used to pop-ups from my Thunderbird mail. During the event I started following more people, and when my SL/FB friend BevanWhitfield noticed me, she quickly recommended Tweetdeck, but also mentioned that I should be careful in joining too many groups. 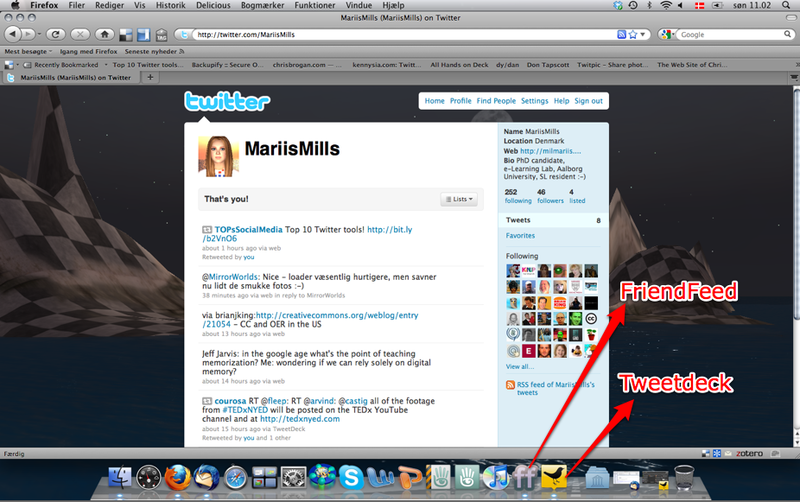 And so I installed Tweetdeck, but it’s a much more complex tool than FriendFeed. I had a look at SIGs related to e-learning and there were soo many! And which one do you choose then? Another friend of mine made a “mention” in Tweetdeck and I wasn’t sure how to reply. A nice feature was the ability to synchronize with other accounts such as FB, but here I’m wondering if that’s really what I want to do. There’s bound to be a lot of redundancy, and I need to figure out how to handle that. In sorting the information hashtags (#) seem to be part of the solution, but this is also something I need to learn more about. My SL/FB friend, ldinstl_chimera, pointed my attention to Backupify, which may turn out to be a great service for storage and management, whereas Arielion Clawtooth, mentioned Twapperkeeper, so there are plenty of new things to figure out. Incidentally, today TOPsSocialMedia tweeted a list of top 10 Twitter tools.